What Else Can I Expect From an Online Doctorate in Public Administration Program? With young people flooding into urban areas, there are several jobs available in the public and nonprofit sectors of American cities. Consequently, there has never been a better time to earn a doctorate degree in public administration. College professors -- the most popular career for those with doctor of public administration online degrees -- are earning more than $75,000 per year, and Bureau of Labor Statistics projects that the field will grow by 13% over the next 10 years. Now is the perfect time to earn an online doctorate in public administration. While work experience can certainly help your application, you do not need previous work experience to get into an online doctorate in public administration program. However, you do need a master's degree in public administration, with at least a 3.0 GPA, and you will need to submit GRE scores. There are currently only six doctor of public administration online programs. The programs primarily differ in terms of capstone experience; most require a dissertation, except West Chester University, which requires a project and a comprehensive exam. Each program awards a doctor of public administration, except Tennessee State, which awards a PhD. CAN I WORK WHILE I COMPLETE MY ONLINE DOCTORATE IN PUBLIC ADMINISTRATION? Yes. Since a doctorate is more academically intensive than a master's, most online doctorate in public administration programs are taught synchronously. Classes typically meet online one night a week, since they are designed for the busy schedules of working professionals. The ideal candidate for these programs already works in public administration, though employment in the field is not required. Most online doctorate programs in public administration only require one night of attendance per week. They fit a variety of schedules, to meet the needs of professionals already working in the field. The main advantage of earning your doctorate online is convenience. You can increase your salary and advance your career prospects without uprooting your life. VSU offers an doctor of public administration online program designed for working professionals in governmental, nongovernmental, or nonprofit organizations. This 54-credit program can be completed entirely online with the exception of the first week of the fall and spring semesters when students must participate in residency seminars on VSU's main campus. Online courses are delivered asynchronously, allowing students to complete coursework at their own pace. Coursework is split into core, theory/method, and elective courses. Students must also complete a dissertation and several capstone and project courses. Transfer students may apply up to 15 credits of coursework towards their degree as long as it was earned at another accredited university. Students must earn their degree within seven years of admission. Applicants must have a master's degree and submit current GRE scores to be considered. They must also submit a resume, three letters of recommendation, and a statement of goals for advancing their intellectual abilities. WCUPA offers a doctor of public administration online program with a regionally-focused curriculum that prepares graduates for employment in and around the Delaware Valley in southeastern Pennsylvania. This 43-credit program includes four capstone courses, each of which focuses on a different element of an applied project in public administration in the community. Students must also complete three methodology courses and three courses of concentration electives in the areas of criminal justice, geography and urban planning, and social work. The program includes a four-part open-book comprehensive exam requirement in lieu of a dissertation. A required capstone project also functions similarly to a dissertation, as students must choose an adviser for their project and then defend their project in front of a committee of three faculty members. WCUPA is accredited by the Middle States Commission on Higher Education. CBU offers a 50-credit online doctorate in public administration program that can be completed in just three years. This program is ideal for professionals who are already working in the field of public administration. Students are organized into cohorts and must enroll in one course during every eight-week session. Online courses are delivered asynchronously, allowing students to complete coursework at their own pace. This program can be completed entirely online with the exception of certain on-campus residency requirements, including an orientation, a professional colloquium, and a defense residency where students will defend their dissertations. Students must complete a comprehensive experience which helps them decide on a concrete topic for their dissertation. Applicants must have a master's degree with a minimum GPA of 3.0 and complete an interview with the program director to be considered. CBU is accredited by the Western Association of Schools and Colleges. TSU offers an online doctorate in public administration program that was recently approved by the Texas Southern University Board of Regents. Currently, this program is still waiting on approval from the Texas Higher Education Coordinating Board. Once approved, it will be the only program of its kind in Texas and one of only six in the country. The school currently offers an online executive master's of public administration (eMPA) program, of which the doctoral program will likely draw on some of the same course foundations and faculty. Both degrees will be offered through the Barbara Jordan-Mickey Leland School of Public Affairs, which also offers an executive master's of administration of justice (eMAJ) program online. TSU is accredited by the Southern Association of Colleges and Schools Commission on Colleges. Online doctorate in public administration programs differ mainly by coursework, specifically in terms of the capstone experience. While each program helps students build the same skill set, they do so through different coursework. Additionally, some programs require dissertations, while others require a concluding project. 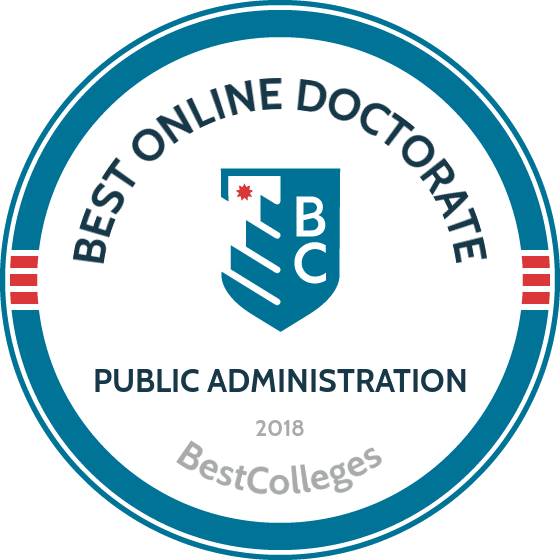 Public administration curricula vary widely, but below are a few courses you'll find in most online doctorate in public administration programs. Qualitative reasoning and analysis (methodology): This methodology course focuses on qualitative methods of research, which inform public policy decisions. Students learn to implement case studies, interviews, focus groups, and other qualitative data collection methods. Quantitative reasoning and analysis (methodology): This course focuses on quantitative methods of research, as opposed to qualitative methods. Students learn to collect hard data, which will inform public policy decisions, and gain a broad foundation in statistics, advanced methods of statistical analysis, and surveys. Public policy, advocacy, and economics: This wide-ranging survey course is often taken early in a student's doctoral studies. The course focuses on the causes and effects of public policy making, emphasizing the global economy and the impact of political organizations such as PACs and NGOs. HOW LONG DOES IT TAKE TO GET AN ONLINE DOCTORATE IN PUBLIC ADMINISTRATION? The time required to complete an online doctorate in public administration varies greatly. Programs generally require 43 to 54 credit hours, which part-time students complete in about three years. As most students are already working in the public administration field, all online doctorate in public administration programs are part-time. Most online doctorate programs use a synchronous, cohort model, in which students complete coursework along with a group of peers. However, estimating the time required to complete a dissertation is difficult, so a program's dissertation requirement can drastically affect completion time. Most online doctorate in public administration programs are either regionally or nationally accredited. The U.S. Department of Education and the Council for Higher Education Accreditation (CHEA) oversees the six regional accrediting bodies, which manage specific groups of states. National accreditation is also overseen by the CHEA, but the accrediting bodies differ based on type of education; different accrediting bodies handle business schools, nursing schools, etc. When reviewing public administration programs, students should look for accreditation from the Network of Schools of Public Policy, Affairs, and Administration (NASPAA). The NASPAA is the foremost national authority on accreditation in the public administration field. With 300 member schools across the country, the organization ensures the academic quality of graduate programs in public administration. For a list of accredited schools throughout the U.S., visit the Department of Education and CHEA websites. Although a bachelor's degree helps professionals obtain entry-level positions in public administration, many positions, such as chief information officer or executive director, require doctorates. Professionals with doctorates earn higher salaries and face lower unemployment rates. The table below demonstrates the difference in pay among public administration professionals with various education levels. Professional experience and education affect the annual earnings of professionals in the public administration field. The following table shows expected salaries for nonprofit executive directors, college professors, city managers, and public policy directors at different stages in their careers. Public administration is a broad field. Those with a doctorate in public administration have a range of employment options, including the option to work in the nonprofit sector as executive and public policy directors. Below are a few of the most popular careers in public administration. The CIO oversees all aspects of information technology within an organization—making decisions, hiring employees, and ensuring the organization's network runs smoothly. College professors teach students and perform research in their field. College professors teach several classes at a time, at the undergraduate or graduate level, and publish scholarly papers on their own academic research. Budget analysts work in the public or nonprofit sectors to help organizations manage and organize their budgets. They create budgets and collaborate with executives to forecast future expenses. Typically working in the public sector, social and community service managers oversee the administration of social services and monitor community organizations. They often oversee a staff of social services professionals. Urban and regional planners work for cities to create land use plans and programs that account for and leverage population growth and expansion. They also reuse, repurpose, and revitalize facilities and buildings. In the public administration field, networking and attending conferences can increase your employability. Particularly in the nonprofit sector, connections made at these events lead directly to jobs. Several professional organizations in the public administration field provide networking opportunities that lead to jobs and professional development. Below are a few of the best-known organizations in the field. The ASPA takes a holistic approach to public administration, promoting education and practice of administration in the public and nonprofit sectors. This organization focuses on the nonprofit sector, aiming to strengthen practice in the field through research and consulting. The ICMA focuses on city management and planning, in areas such as community engagement, financial management, and economic development. Regardless of which online public administration program you choose, the first step to funding your education is filling out a Free Application for Federal Student Aid (FAFSA). Additionally, explore the numerous fully funded programs in public administration and adjacent fields, such as public policy. Doctoral candidates near Washington DC are even more likely to find programs offering substantial financial support.